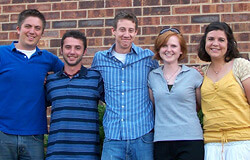 DCI summer internship class of 2007. Drum Corps International is looking for a few highly talented college students to join our winning team as interns during the winter and/or summer semesters. Our internship opportunities will provide motivated candidates with outstanding real-world experience in a variety of exciting disciplines. Interns will work side-by-side with an experienced group of dedicated professionals in a fast-paced, dynamic and fun setting which celebrates the achievement of excellence in the performing arts and in life. The winter internship session runs from January through April, and the summer session from May through August. Visit DCI.org/internships for a complete list of available opportunities and requirements.